Using lace cookies or tuiles, you can wrap them around the handle of a whisk to form cannoli shells. 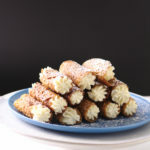 I just love the cannoli filling in this recipe because it's the perfect balance of flavor between mascarpone and ricotta, and pipes amazingly smooth. In my world, when you love someone, every day is an opportunity to show that love, not just Valentine’s day. Last week, my husband walked in the door carrying a cheery bouquet of sunflowers, and I truly felt…so adored. So I figured, why not give you something spontaneous and special? Let me tell you, these pecan tuile cannoli are no ordinary box of chocolates! They are lace cookies piped to the brim with gloriously creamy cannoli filling. This is what a Valentine grand gesture looks like: a pyramid of tuile cannoli dusted with powdered sugar. When you get to see that little kid come out of your adult husband, you remember that moment. Cherish it. Because that is pure magic. 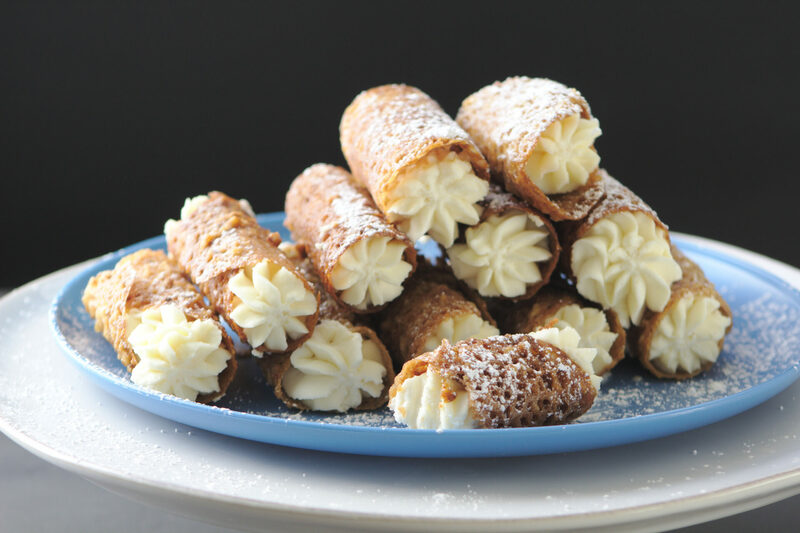 After doing an internet search, I found many cannoli filling recipes in circulation that are equal parts mascarpone and ricotta with powdered sugar (ugh, that taste). But, I decided to test the filling with a higher proportion of mascarpone with granulated sugar (less of “that” taste). What you’re getting today is the ideal balance of ricotta to mascarpone for the most luxurious center. We are talking highly pipe-able cannoli filling, none of that gloppy stuff. I think you will find the consistency to rest between light and decadent. In true Frayed Apron fashion, I’ve co-opted several taste testers for these cannoli and two rounds of filling to arrive at what has been deemed “perfect”. Cannoli filling can be made with ricotta or mascarpone, and to get even more confusing, a combination of both. Normally, I lean more in the mascarpone camp for cannoli so I tried a 100% mascarpone filling right off the bat. What I noticed is that it creates a very dense texture that distracts from the delicate crunch and honey-pecan notes of the tuile. Turns out, mascarpone lightens up with even a small amount of ricotta, and the flavor is incredible. That said, I’ve opted for a cannoli filling that is majority mascarpone with a small amount of ricotta. We’ve all had traditional Italian cannoli, but I like the simplicity of a tuile shell. It’s a highly versatile cookie made from a very wet batter. A spoonful of tuile batter becomes wafer thin when baked because the sugars spread out and caramelize. My formula combines rich maple syrup + honey along with a tiny bit of savory pecan + flour. From this, we get a pliable round disk that crisps up in minutes. By adding crunchy pecan, these tuiles form a lace-like pattern in between the nut and almost transparent sugar. For Valentine’s day, a lace cookie seems appropriate. Great news! You don’t need to hunt for cannoli shells or spend tons of time making them from scratch. I’ll show you how easy it is to make cylinders using a tuile cookie. You’ll be producing professional quality cannoli in less than 30 minutes. Tuile batter bakes for 10 minutes. We let the hot tuiles rest for 2 minutes, then work an offset spatula underneath so we can wrap them around a cylinder while they’re hot (i.e. pliable). Since I don’t have cannoli forms, I just use the base of a whisk. See? Easy. Using lace cookies or tuiles, you can wrap them around the handle of a whisk to form cannoli shells. 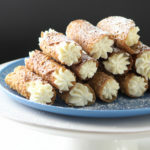 I just love the cannoli filling in this recipe because it’s the perfect balance of flavor between mascarpone and ricotta, and pipes amazingly smooth. Add cannoli ingredients to a food processor fitted with a metal blade. Process until completely smooth, pausing to scrape the bowl. Use a rubber spatula to fill a piping bag fitted with a star tip. Refrigerate until ready to pipe. Preheat oven to 350°. Line two cookie sheets with parchment paper or a silpat. Spread the pecans on a baking sheet and toast just until fragrant, about 10 minutes. Remove from the oven and add to a food processor. Pulse until coarsely chopped. Place in a medium bowl along with the flour and tapioca flour. Whisk to combine. In another bowl, whisk the oil, honey, maple syrup, vanilla, and salt until thoroughly combined. Add to the dry ingredients, mixing just until thoroughly moistened. Set batter aside for 15 minutes. Use a full Tablespoon to get equal portions, don’t flatten or spread. Drop 3 inches apart or 6 per sheet and bake for 10 minutes, until golden brown. Let cookies sit for 1-2 minutes, then use an offset spatula to carefully remove cookies. 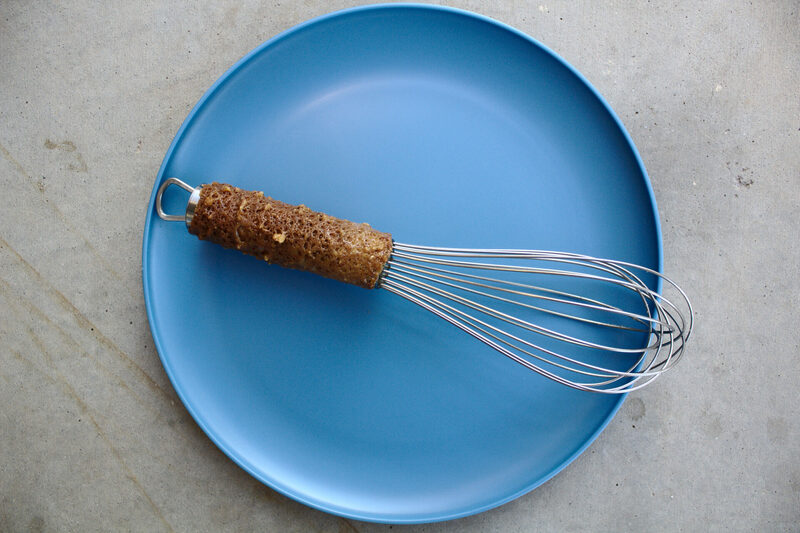 Fold cookies over a whisk handle and let harden into a cylindrical shape. Repeat procedure for 15 cannoli shells. Tuiles are best served fresh and crunchy. Humidity and moisture will cause the tuiles to become sticky, so only pipe the cannoli when ready to serve. To store cannoli, it’s best to refrigerate in a breathable container to allow excess moisture to escape. Once piped, cannoli should be enjoyed as soon as possible for a crispy shell (within 24 hours).